Indigo Car Hire UK acts as a car rental agency that finds you the best offer available for cheap car rental in U.K and elsewhere. With great customer reviews, unique features and a simple, easy-to-use site, Indigo is a promising site for anyone looking to hire a car. 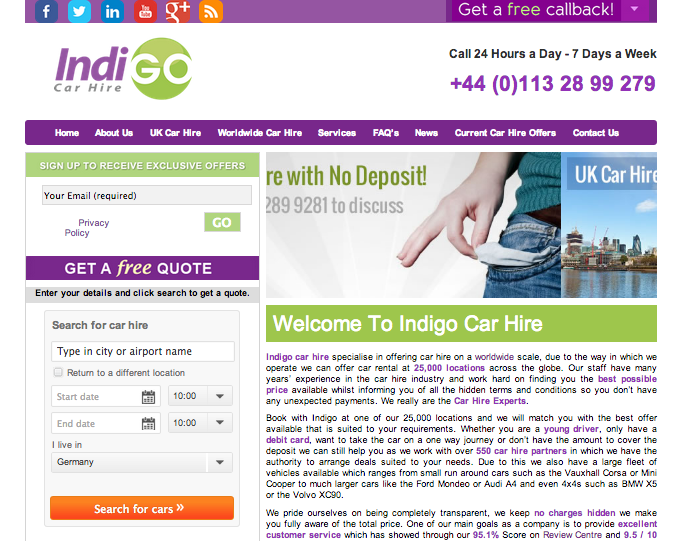 Indigo Car Rental is a fantastic place to find and rent cars- with very little negative feedback, a useful customer service system and a dedication to finding the right deal for you, anyone looking for a car to rent in the U.K. or abroad would do well to check out this site for some great deals and the opportunity to save a lot of money.